The Platinum series from British loudspeaker expert Monitor Audio, represents the finest engineering in the company's comprehensive portfolio. Amongst other luxuries, Platinum is known for its high-quality ribbon tweeter units, which as we discovered, are excellent at delivering fidelity. We have already covered the flagship PL300 floorstander in an extended review, but now it's the turn of the compact and more affordable PL100. This domestically friendly two-way design, is about as different from the PL300 as you can get (except that they share the same basic technological underpinnings). Where the PL300 is a massive four-driver floorstanding wardrobe of a loudspeaker, the PL100 is a relatively petite two-driver standmount, which is based around a clever ribbon tweeter that's also used in its larger sibling. Although this impressive unit is said to work all the way to 100kHz, measuring such frequencies is notoriously tricky and not altogether reliable. 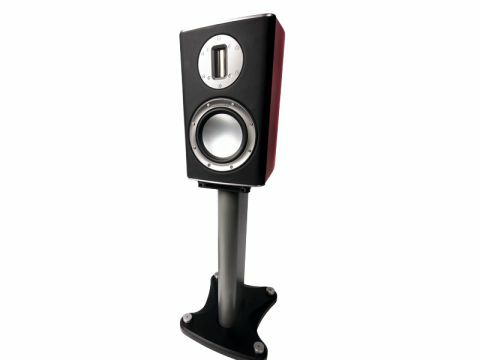 Monitor Audio offers an optional dedicated stand that bolts directly to the base of the speaker for optimal coupling, although at £350 per pair, we'd also consider something like the market-leading £300 Partington Dreadnought Broadside. The PL100 uses a vented bass reflex design, with a 17cm bass/mid driver and a home- grown ribbon tweeter which takes over at a comparatively low 2.8kHz. System sensitivity is typical for a compact design at 88dB, which is slightly disguised by the four ohm nominal impedance and power handling is 120 watts. Although none of this could be described as revolutionary, the materials and technologies used certainly are. The bass driver diaphragm is a smoothly dished, skinned sandwich cone with a honeycomb Nomex core. Light and stiff, it's powered by an elaborately designed magnetic engine. The ribbon tweeter was designed and built in-house and features an extremely lightweight ribbon, investing the unit with a lightning-fast transient behaviour and one which is said to be responsible for the impressively wide frequency coverage. For many, however, the enclosure itself will be the most remarkable visible element of the design. Available in conservative wood veneers, all edges are smoothly radiused and superbly finished, while the carcases are multilayer plywood laminations and the baffle is cast from a mineral-loaded thermoset polymer, chosen for its low resonance qualities. The boxes are extensively braced with a front-rear steel reinforcing structure and a brace whose end point can be seen on the back panel. The PL100 is also carefully damped with a bitumastic material and finished in an impressive piano lacquer. The speaker's 'HiVe' port is a low-turbulence design, in some ways reminiscent of Bower and Wilkins' 'golfball' unit. Completing the speaker at the back are some well-finished platinum plated bi-wire terminals, but it would have been preferable if the links between bass and tweeter had been made of wire, rather than the pressed metal links used here. Listening to the PL100 is a truly enlightening experience, though having recently spent some quality time with the superb Platinum PL300, we were also confident in the standmount. This is a supremely well balanced design, which is easy on the ear and comes without the overblown quality of some high-end designs. In particular, and this is without question the speaker's crowning glory, it has a truly superb tweeter, which is sharp, clear and precise. It lacks any undue emphasis and has none of the excessive sharpness that's sometimes apparent in other leading tweeter designs. In contrast to many other tweeters, you don't really hear it in it's own right separately from the speaker as a whole. The ribbon has a relatively wide lateral coverage, not always to be taken for granted with ribbons, so that listening from the side does not quickly result in a collapse of the stereo soundstage into the nearest speaker, or severe loss of stereo imagery. Vertical dispersion is good by ribbon standards, but by no means significantly better than most conventional dome tweeters. From the conventional directly ahead position, the 100 offers tremendous image specificity, with pin sharp positioning cues. As usual, we used a number of discs during the review's preparation, several of which were clear evidence of the recording venues' acoustics and the reverberation pattern. The effect was as clear as with any much larger, more ambitious speakers. All that's missing is the sense of scale and depth that was suggested by the music. For example, playing Bruckner's Ninth Symphony from the Gunter Wand SACD set suffered. It was also true of a recording of Arvo Part's Passio (the former has been reviewed in Choice Cuts section in the past), the devastating scale and authority of the sound was clearly there on the disc, but the comparatively limited bass extension of the speaker didn't allow these elements to be expressed fully. Of course, we're dealing here with the immutable laws of physics, so such limitations are natural. Small speakers simply don't do certain things that big ones do. Even so, and although the bass is relatively lightweight, the Monitor Audio PL100 is more than capable of filling a large-sized listening room. If the bass was just a little under-powered, you could tell immediately that something was missing. Okay, it didn't actually plumb any great depths in the bass, but all the cues were reproduced intact. The bottom line is simple enough: this is a fabulous speaker that's wholly appropriate to high-resolution systems, thanks to its excellent wide bandwidth ribbon tweeter. It looks great and is clearly an object that has been crafted skilfully and tuned to perfection. Making allowances for the compact nature of the design, it should be hard to better, this despite a minor cosmetic blemish on one speaker of the test pair, where the gasket between the baffle and the enclosure hadn't been lined up properly. It is a relaxed loudspeaker to listen to, one that does little, if anything to conceal the architecture of the music. If you really want more in terms of scale – the kind that only a larger (or multiple) driver area can produce – you're going to have to swallow hard and go for something physically a lot bigger and more costly – the Platinum PL300 being the obvious choice, as Monitor Audio doesn't currently manufacture anything inbetween. It's about time they did, to prevent the Platinum range being sidelined here in the UK.